They were going to the national cemetery to pay tribute to prominent Chinese leaders, followed by a visit to Tiananmen Square to lay flowers. Instead, they ended up in the black jail at Jiujingzhuang. Wen Jiabao's proposals are an illusion; he wants to change judgement on Tiananmen movement. Activist Mao Hengfeng is arrested. Beijing (AsiaNews/CHRD) - Beijing police took into custody more than 2,000 petitioners who were on their way to the Babaoshan Revolutionary Cemetery to observe Qingming (Tomb Sweeping Day), a Chinese festivity marking devotion to ancestors, on Wednesday. 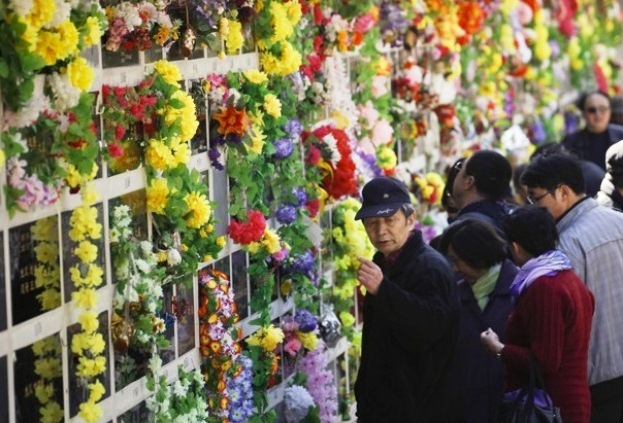 Afterwards, they would head to Tiananmen Square to lay more flowers. Babaoshan is China's national cemetery. It contains for example the tomb of Zhao Ziyang, Communist Party secretary in 1980s who was removed for opposing the Tiananmen crackdown. More than 500 petitioners from Shanghai were among the people detained. Beijing police stopped them before they could reach the cemetery and forcibly drove them to the black jail at Jiujingzhuang. The petitioners reportedly intended to pay their respects at Babaoshan, the national cemetery, by sweeping gravesites and laying flowers and then head to Tiananmen Square to lay more flowers at the foot of the Monument to the People's Heroes. The day after, so many petitioners were placed in the black jail that many of them had to stand in a courtyard since there was not enough space to sit inside the facility. Recently, reports that Premier Wen Jiabao would ask the party to change its judgement on the Tiananmen Square movement have caused a stir. Since 1989, it has been official dogma that latter was "counterrevolutionary;" yet, a change would increase pressures for political reforms. Wen also suggested that censorship on Tiananmen might be relented. However, many analysts believe that Wen's pro-reform ideas are an illusion. On Qingming, Beijing police also arrested activist Mao Hengfeng and ten others for visiting the tomb of Yang Jia, a man convicted and executed for killing six police officers in Shanghai. For many Chinese, Yang is a hero, a symbol of resistance against the dictatorship.